I saw this recipe and decided that I needed to make it. I haven’t had grilled veggies in a long time, and when it was super nice out in this usually blustery weather, we thought we’d take advantage of the nice weather and pull out the grill. The veggies grilled up fabulously, and I have to say that the pepperoni was even better! It crisped up wonderfully, and it was nice to know that lots of the grease just dripped right off of it. It just added a little something extra to the veggie – a new spin, if you will. 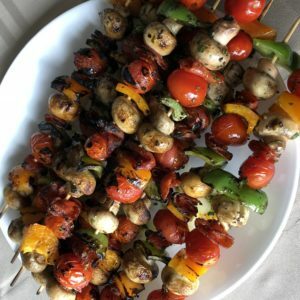 **You can serve these on the skewers or you can take them off of the skewers and put them in a bowl. They look beautiful that way, too. If you want, you can also add some chunks of fresh mozzarella to the bowl (don’t grill the cheese on the skewers…it would melt right off!). **These taste delicious reheated, too, so make some extras! Thread the bell pepper, mushrooms, grape tomatoes, and pepperoni onto the skewers. In a bowl, combine the olive oil, garlic, basil and oregano. Lightly brush the skewers 2-3 minutes per side. Serve the skewers with a marinara sauce for dipping.